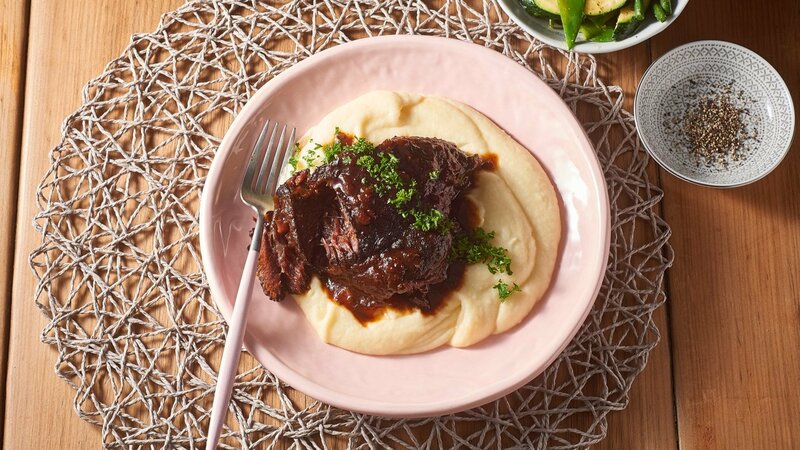 Melt-in-your-mouth beef dish with a Mexican flare and creamy mash to satisfy the palates of your residents. Combine all the ingredients together and let them marinate for a minimum of 1 hour. Once marinated, place all ingredients in a gastronome tray and cover with a lid before putting in an oven at 190 degree celcius for 30 minutes. Reduce temperature to 160 degree celcius and cook for 3 more hours or until cheeks are tender. Once tender, remove meat from liquid and reduce liquid by half. Bring water and salt to the boil. Turn off heat and add cold milk. Whisk in the Knorr Potato Flakes until combined. Stand for 2-3 minutes before whisking again. Keep warm. Place cooked cheeks on top of the mash with reduced braising liquid as the sauce. Serve with zucchini and green snow peas.